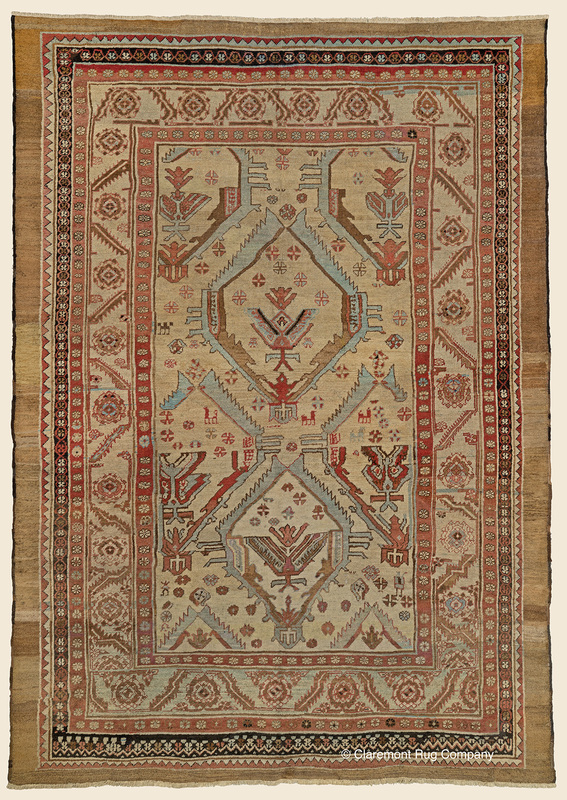 Search Our Inventory / All Rugs / 7&apos; 8" x 10&apos; 8"
7&apos; 8" x 10&apos; 8"
(Connoisseur-Caliber) ("Fall 2018 Print Catalog, p.1") Amply possessing the unabashed freedom of expression for which antique Bakshaish rugs are renowned, this remarkable antique carpet presents a one-of-a -kind pattern imbued with creative choices expressed inch by inch as it was woven. Based on elongated, subtly repeated hexagons, this folk art carpet�s intriguing complexity could be dynamically integrated into either a contemporary or casual environment for standout impact. Winged phoenix motifs�a storied archetypal device only very seldom seen in Persian carpets--are impressively stylized and highly unusual; each iteration is entirely unique. Spacious, unevenly angular border designs are the perfect accompaniment to the diagonal orientation of the field. This rarely captured, effortless interplay, that is so enjoying to live with and on, reveals Bakshaish spontaneity and harmony at its best.